Searching for a Russian Christmas confection, culinary expert Jennifer Eremeeva finds inspiration in the Russian ballet masterpiece synonymous with the holiday season: Tchaikovsky’s Nutcracker. Join her in the kitchen and learn how to make festive cupcakes and sugar plums. Is there anything more holiday mood-enhancing than the familiar strains of Tchaikovsky’s TheNutcracker? If there is, I haven’t encountered it yet. The strong downbeat followed by the robust and festive march is a clarion call to trim the tree, stuff the stockings, and sift the dry ingredients. And in honor of Russian Christmas, we are laying on a sugary smorgasbord of Nutcracker-themed confectionery! Food is the candy cane stripe that runs through the ballet: From the moment the curtain rises, we are plunged into a world of expansive and lavish Russian holiday entertaining; in the second act we join Clara/Maria and Prince Johann in the magical Kingdom of Sweets, where we meet dancers impersonating flavors such as ginger, candy canes, chocolate, coffee, marzipan, and, of course, the Sugar Plum. Americans associate The Nutcracker with George Balanchine, who co-founded the New York City Ballet and gave us one of the most famous screen versions of The Nutcracker (1993), starring Darci Kistler as the Sugar Plum Fairy and Macaulay Culkin as the Nutcracker. Balanchine’s staging remains the template for all Western interpretations of Tchaikovsky’s beloved Christmas ballet, but, of course, his inspiration was firmly rooted in Russia. Born Georgi Melitonovich Balanchivadze in St. Petersburg, Russia in 1904, Balanchine was trained as a dancer at the prestigious Imperial Ballet School. As a child, he was fascinated by the trays of sweets on display in the opulent windows of Yeliseyev’s grocery store on Nevsky Prospekt. This Petersburg landmark survived the Communist era and is now once again offering visitors tempting bonbons confected of sugar, almonds, marzipan and glistening sugar atop syrupy candied fruit. On a recent visit to St. Petersburg, I retraced Balanchine’s steps from the Imperial Ballet School on Rossi Street, through Ostrovsky Square and across the Prospekt to Yeliseyev’s to shelter from a sleet storm. Seated on the perimeter of the massive pineapple, which graces the center of the store, I sipped a welcome cup of Yeliseyev’s signature tea blend, indulged in a sliver of rich chocolate torte and treated myself to the feast for the eyes that the confectionery cases offer. And then I understood what Balanchine was striving for in his staging of The Nutcracker: sweets as both cozy and comfortable, but also other-worldly and magical. So, with all of these visions of sugar plums “dancing in my head,” I set about creating a little culinary tribute to The Nutcracker, and inaugurate a new tradition in our family for Russian Christmas. I took as my inspiration the Divertissements in Act II, which follow the arrival of Clara/Maria and the Prince in the Kingdom of Sweets. These set pieces contain some of the most recognizable tunes from the ballet and culminate in the comedic arrival of Mother Ginger and her children. Mother Ginger’s large skirt is a nod to a famous candy tin, popular in Imperial Russia, in the shape of woman in a wide hoop skirt. No culinary homage to The Nutcracker can even begin without the signature sugar plums. In Balanchine’s day, these were most likely complex and syrupy bonbons: layers and layers of sugar wrapped around one almond or a cardamon seed. But equally possible is a much more manageable and equally delicious ball of dried fruit and nuts, steeped in liqueur and rolled in sugar. “Plum” in the language of the 19th century was synonymous with “paramount” or “best” and so a sugar plum is the queen of the sweets. The Russian candy canes top off festive Red Velvet and Candy Cane Cupcakes, and Mother Ginger makes her appearance in my favorite Guinness Gingerbread Cupcakes, which are frosted with tangerine-flavored icing in a gentle nod to the more current Russian holiday flavors. This is a wonderful project to share with children, who will find icing and decorating the cupcakes an absorbing and enjoyable activity on a cold winter’s day! So crank up The Nutcracker, roll up your sleeves, and let’s get baking! Wishing you delicious things in 2015! My daughter Velvet is addicted to Red Velvet cupcakes and I’ve tried every recipe out there since they don’t sell it in a box in Russia! The most reliable and delicious version was one I discovered this year from Sally’s Baking Addiction. 525 ml (2-1/2 cups) of powdered sugar; 117 grams (1/2 cup or one American stick) of unsweetened butter; 1 pinch of salt; 5 ml (1 tsp) of vanilla extract; 45 ml (3 tbsp) of heavy cream; 30 ml (2 tbsp) of Cointreau — optional, but very nice! 1.Preheat the oven to 180℃/350℉ degrees and adjust the oven rack to the middle position. 2.Line a standard muffin tin with pink paper liners. 3.Sift together the flour and cornstarch. Whisk these together with the cocoa, baking soda, and salt. 4.Place the butter in the bowl of a standing mixer. Use the paddle attachment to beat the butter on high speed until creamy. Add the sugar and beat on high for 2 minutes, then add the oil and beat for an additional 2 minutes. 5.Add the egg yolks and the vanilla and beat on medium until combined. Add the vinegar and food coloring by droplets until you get your desired color. Remember that food coloring is highly concentrated! Scrape down the sides and beat until combined. 6.Add the dry ingredients in roughly three batches, alternating with the buttermilk. Work quickly and don’t over-mix! Set the batter aside and in a separate bowl beat the egg whites with a handheld mixer until they are thick and foamy. 7.Fold the egg whites into the cupcake batter with a wooden spoon until combined. Pour the batter into the prepared cupcake liners, filling them about two thirds of the way. 8.Bake for 20 minutes until the cupcakes are springy and a toothpick inserted into the cupcakes emerges clean. 9.Cool in the pan for 5 minutes, then transfer to a cooling rack to cool completely. 10.Crush the 4 candy canes to dust in a plastic bag by banging a rolling pin on top of them, or by placing them in a food processor fitted with a steel blade. 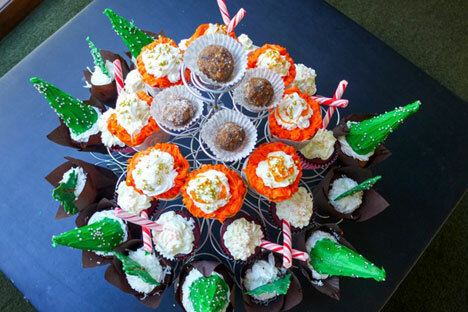 Fold the crushed candy canes into the basic frosting and then pipe or spread onto the cupcakes. Insert a candy cane stick into each. Sprinkle decorative balls on top if desired. For me, Christmas is not complete without some form of gingerbread and this recipe for Guinness gingerbread, inspired by the famous recipe in The Last Course: The Desserts of Gramercy Tavern is one, which makes a steady appearance from late November through early January. The addition of candied ginger is my own, and I think it packs a lovely zing, as well as being an appropriate nod to Balanchine’s fascination with the candied confections at Yeliseyev’s. 1.Preheat oven to 180℃/350°F. Adjust the oven rack to the middle level. 3.Pour the stout into a large sauce pan. Let the stout sit for about 5 minutes to allow the foam to quiet. Add the molasses and set over a medium-high heat. Stir to combine as you bring it to a boil and the molasses melt. Remove from heat, then add the baking soda. Set aside and allow the foam to completely disappear. 4.Meanwhile, in a bowl, whisk together the eggs and both sugars, then whisk in the oil. 5.In a separate bowl, whisk together the flour, ground ginger, baking powder, cinnamon, cloves, nutmeg, and cardamom. 6.Combine the stout mixture with the egg mixture, then whisk this liquid into the flour mixture, half at a time. Add the fresh ginger, orange zest, and candied ginger and stir to combine. 7.Pour a scant 1/3 cup of batter into each paper liner. Bake cupcakes for 24 minutes or until the top springs back when gently pressed. Allow to cool in the pan for 5 minutes, then transfer to a wire cooling rack to cool completely. 8.Divide the frosting into two equal parts. 10.Beat the orange extract and orange food coloring into the other part until they are combined. 11.Pipe the frosting on to the cooled cupcakes. 1.Combine all of the ingredients except the Turbinado sugar into the bowl of a food processor, fitted with a steel blade. Pulse to combine until smooth. 2.Pour the Turbinado sugar into a flat plate or cookie sheet with a shallow lip. 3.Roll approximately 1 tsp of the mixture into a smooth ball, then roll it in the Turbinado sugar to coat the surface. 4.Place each sugar plum in a paper liner or candy wrapper. Chill for 2 hours before serving. Priyatnogo Appetita — S Novym Godom!